So it’s that busy September back-to-school time when thoughts turn to refreshing our students’ learning skills and strategies. 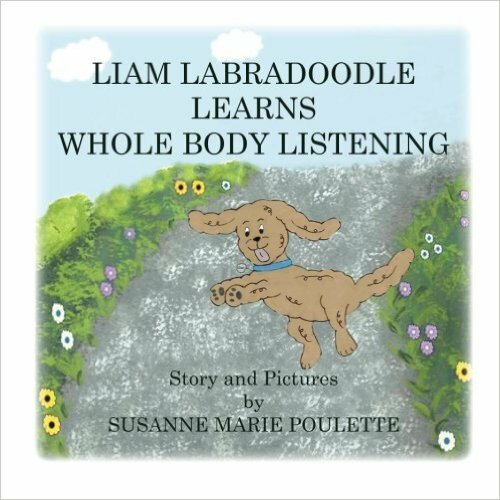 Among the tools for teaching and sharpening listening skills is good old Whole Body Listening. Brain – thinking about what the ears are hearing. Eyes – looking toward the speaker. Seat – firmly in the chair or on the floor. Feet – quietly where they should be (floor or criss-cross applesauce). The critical word here is “tool.” WBL should be modified as needed for students who have special needs, difficulty with self-regulation, or discomfort with eye contact. It should always be used with sensitivity for a child’s developmental readiness and attention span level. WBL lessons are suggestions for teaching and practicing listening skills. WBL is a teaching tool that can be used as a key phrase to pre-set, or as a reminder for good listening, but not for lengthy performance expectations. If I could identify the most critical element of WBL, it would be listening with the brain. When I think about what a speaker is saying, I’m essentially connecting my mind with that speaker’s mind. Isn’t that true attending and authentic listening? Listening with the brain can also help us develop an internal schema as we think about what we are hearing and form mental images. In this way, thinking about what is being said can encourage visualization, and perhaps this might increase comprehension and retention. We know that children learn by watching, listening, and imitating. In fact, we may know all too well how fast a child can learn a naughty word or behavior! The same holds true for listening. When we’re good listeners, we demonstrate how we want our students to listen. Without interrupting or rushing, by maintaining eye contact and attention, we listen well and model the same courtesy to students as we do to adults. Brainstorm examples of good vs. poor listening and generate lists. Encourage students to reflect on the effort involved in their own listening: Is it easy or difficult? What makes it easy or difficult? When, why, where is it easy or difficult? What are some solutions for making listening easier? Ask, “Listening is a skill, so how do you get better at a skill?” Elicit discussion: “Skills improve with correct practice, like throwing a ball, tying shoe laces, playing an instrument…” Encourage students to make this connection and understand that we can improve our listening skills. We LISTEN with BRAIN, EYES, MOUTH AND CALM BODY. TV is turned on, but set at a blank screen: “TV is ON”— is like HEARING. TV is turned on and “TUNED IN” to a real channel — is like LISTENING. TUNING IN makes the difference. TUNED IN means we connect our brain to the message; we think about it, focus on it, and give it importance. Use the key words to teach self-monitoring: “Am I TUNED IN to the listening channel or a blank screen? When listeners are distracted and then they hear the speaker say something like, “Now don’t forget…” or “What do you think about…” That’s a cue to click themselves back to the listening channel. Liam and Lily entertain as they teach their lesson in this enchanting read-aloud story for preschoolers, kindergarteners, and first and second graders. Now available on Amazon. Click the cover to go there. Back to School: listening required.